Any issues, problems or troubleshooting topics related to the Prepar3D client application. There are also reports on AVSIM that some users having sound issues had their sound settings configured for 16 bit and changing it to 24 bit resolved their problems. Where can IU change this parameter ?? Unfortunately there will not be a fix until 4.5 comes out. Unfortunately I've had to roll back to v4.3. I added the line to the .cfg file and change my audio to 16 bit as indicated above. The sound problem remains. I'm quite disappointed since it's been my philosophy to use the latest version. This is a first for me. Hi , thanks. I am not too sure re this; do I just open the file, edit and add the text anywhere in the sound section and then save? Adding the line time_constant=0 did not help. Does it matter where I add it under the [SOUND] section such as beginning or end? Disregard, I addded the fix correctly and it worked. In case anyone needs a laugh I kept adding the text into the the text document instead of the .cfg file. I'll take my bow now. When I launch the prepar3d I heard the sound just for 1 second then silence. I tried also to add the line into my config file. I tried to open the p3d sound file from windows explorer, same issue. So I unistalled my onboard sound card and it works. 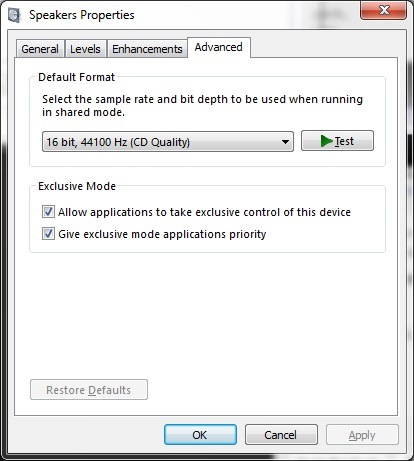 I added the edit line at the top of the sound section in my cfg and it fixed the problem. Simbol-- Where did you take that screen shot of your Sound Properties? In Windows 10, or a different program? I cant find a window like that to check.